My apartment has only two things in it: video game controller cables, and a cat. Okay, there’s also some furniture, but most of the time, it does feel like my home life revolves around keeping my cat entertained with any object other than video game controller cables. Over time, I’ve learned some techniques to stop him from playing with these dangerous yet tantalizing wires. When I first got my cat, he was still a kitten and his need to play with anything that looked like a piece of string seemed almost involuntary. If any cord-like object within a ten-foot radius moved so much as an inch, he had to pounce on it. Didn’t matter whether he was in the middle of his dinner or on his way to his favorite windowsill perch. That string had to get subdued first. I never did, though, because I didn’t want my cat to see that type of cable as a toy. In those moments, I would let the cable rest on the ground, making it seem as unexciting as possible. I would dig a pole toy with a feather on the end of it out from its hiding place in my couch cushions, and I’d dangle it until my cat unraveled himself from the controller cable and came over to play with the moving object. Over time, my cat seemed to learn that controller cables were not as exciting as his actual toys. I’ve never bothered to buy cable covers or citrus oil spray, but both of those methods supposedly also get cats to turn up their noses at electrical cables. 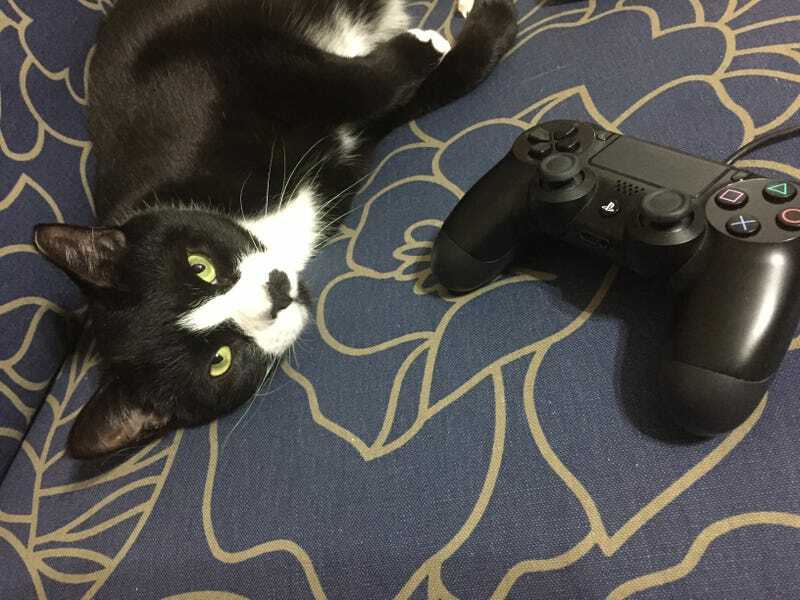 Ultimately, my cat’s playful behavior tends to be a sign that it’s time to hit the pause button and look away from the screen for a couple of minutes to play the greatest game of all: entertaining my adorable cat. It’s a chance to rest my eyes, take a break from a hard puzzle, and ensure that my cat doesn’t hurt me or himself with those teeth and claws. Everybody wins.